The value retailer topped revenue, earnings, and same-store sales estimates. Shares of Five Below Inc. (NASDAQ:FIVE), a retailer offering products for under $5 targeted to tweens and teenagers, were soaring 17% as of 10:43 a.m. EDT on Friday, after the company released better-than-expected results for the fiscal 2018 second quarter. Net sales jumped by 22.7% to $347.7 million during the second quarter, easily topping analysts' estimates calling for $335 million. The gain was driven by new store openings, but Five Below also managed to increase its comparable-store sales by 2.7%, ahead of forecasts calling for a 0.1% increase. Net income soared 49.1% to $25.1 million, or $0.45 per share, topping analysts' estimates of $0.38. We are very pleased with our second-quarter results, which exceeded our expectations. Sales grew 23% driven by strong performance from both new and existing stores. We saw broad-based strength across our worlds as our high quality, trend right products at incredible values continued to resonate with customers. 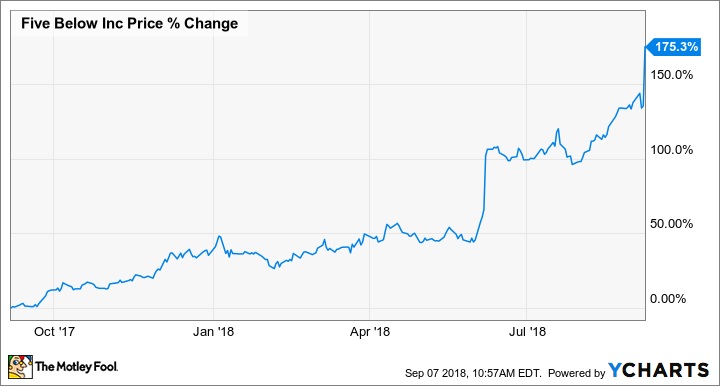 Investors continue to be optimistic about Five Below, with its stock up 175% over the past year alone, and nearly 300% over the past three years. Going forward, management will focus on its digital marketing growth strategies, increasing its scale, and growing its brand awareness. Partly due to those initiatives, management expects third-quarter comps to increase at an even stronger rate, ranging from 3% to 4%, and for another 50 new stores to help power total net sales.